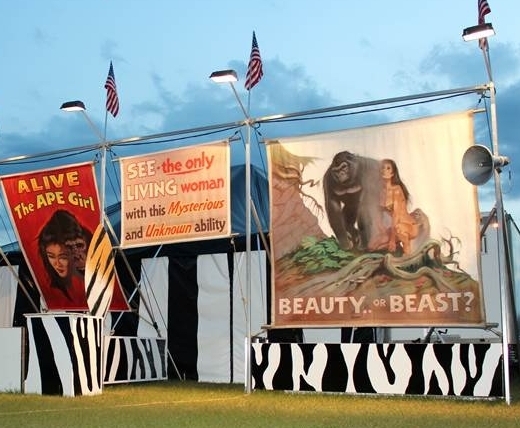 One of Thor’s vacant lots in Coney Island is actually getting an entertainment attraction if only for a three day run. “Purge Breakout: An Immersive Escape Experience” is opening on Friday the 13th and staying through Sunday. Traveling through the U.S. this summer, the escape game/haunted house offers fans of the film franchise “The Purge” an opportunity to step inside the world created by Universal Pictures and Blumhouse Productions. 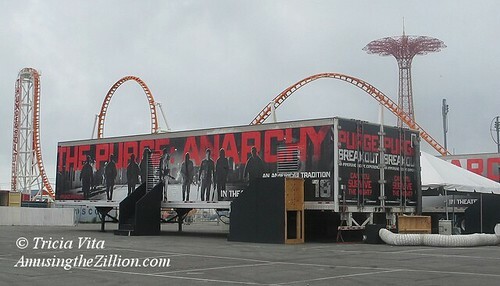 The trailer trucks housing the attraction pulled onto the lot behind Nathan’s yesterday and are setting up. On the plus side, the attraction will bring people to Coney Island who purchased the $20 timed tickets in advance and are likely to spend money on food, drinks and rides afterwards. If you’re just finding out about it, the tickets are already sold out! Can we do this again next month for Teenage Mutant Ninja Turtles? 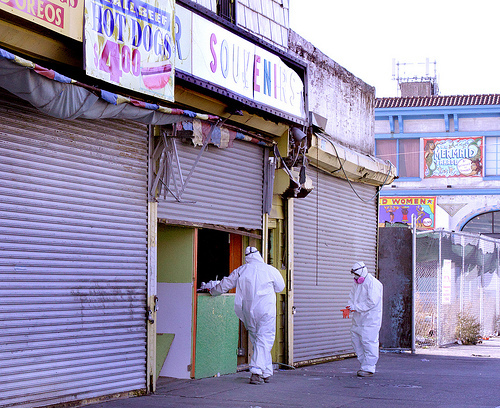 On Saturday, we were alarmed to receive a call about men in hazmat suits starting interior demolition on Thor Equities-owned Grashorn, Coney Island’s oldest building. Asked by a pedestrian if there was danger, a worker replied they were doing demolition. The work continued through the weekend. 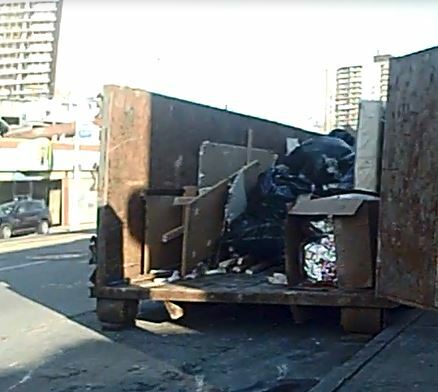 A dumpster in front of the building filled up with sheetrock, ductwork insulation, and mattresses. There are no permits posted, nor are there any work permits on the DOB website for the buildings at 1102-1106 Surf Avenue. Anonymous tipsters sent us these photos. 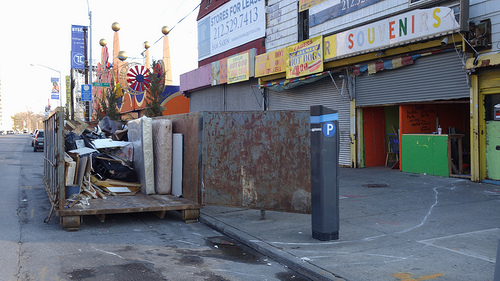 Last month ATZ posted “Rumor Mill Says Coney’s Oldest Building To be Demolished” (ATZ, November 15, 2013). Was the Rumor Mill right? As it turns out, the demo crew was working next door to the Grashorn building where Henry Grashorn’s hardware store was in the 1880s. They are doing interior demo in the neighboring space that was G. Grashorn’s Groceries. The buildings also housed the Grashorn family’s hotel but due to alterations to the facade were not considered eligible for landmarking by the City’s Landmark’s Commission. We’ll look into the matter of the permits this week. In the past, there’s been a lag on updates to the DOB site. In 2010, Thor’s teardown of the Henderson Music Hall caught people by surprise as the asbestos abatement that preceded the demo got underway. Also without any permits posted, it should be noted. The storefronts at 1106 Surf Avenue are newly vacant, having been occupied by Gameworld arcade, a pina colada stand and other concessions for the past four seasons. 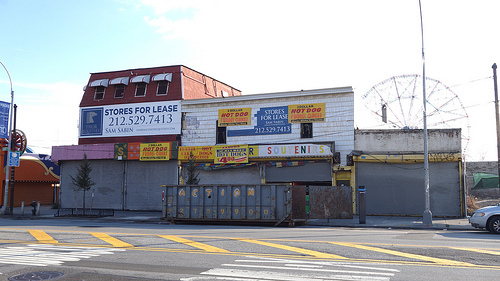 The neighboring Grashorn building at 1102-1104 Surf Avenue, which also has frontage on Jones Walk, has been vacant since 2008 as ATZ reported in “The New Coney Island: A Tale of Two Jones Walks” (ATZ, Sept. 2, 2013). The Grashorn no longer has a C of O after having been gutted, though it looked great as the Susquehanna Hat Company in an episode of HBO’s Bored to Death in 2011. Save Coney Island has published renderings showing the potential of the building if restored. Henry Grashorn was a founding director of the Bank of Coney Island, the Mardi Gras Association and the Coney Island Church and Rescue Home. His hardware store catered to Coney Island’s amusement businesses for six decades and the building later housed shooting galleries, arcades, and cotton candy and taffy stands. In addition to the Henderson, Thor CEO Joe Sitt demolished two other historic Surf Avenue properties–the Bank of Coney Island and the Shore Hotel in 2010, after his lots on the south side of Surf were rezoned by the city for 30 story hotels. Only the buildings that once housed the Grashorn hardware and grocery store remain. If Coney Island’s oldest is going down to become another empty lot to add to Joe Sitt’s collection of empty lots in Coney Island, it won’t happen unnoticed. We promise to make a lot of noise. Thor Equities purchased the Grashorn (1102-1104 Surf Ave.) for $1.4 million in 2005 and the adjacent building at 1106 for $2.2 million in 2006, according to Property Shark. Sources say the FDNY inspected the building last week and the property owner was fined and required to clean the fire hazard caused by squatters. Squatters have been living there since at least 2010. It takes the FDNY to get Thor to maintain their property and keep it safe? The public cannot access the FDNY’s database but has to put in a request for a search which takes 10 days and costs 10 bucks. Betcha 20 we’ll have more info from the Rumor Mill sooner than that! 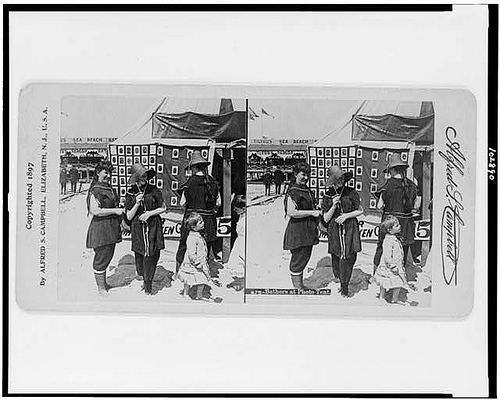 Ever since the 19th century, beachside and sidewalk photo studios have offered tourists a chance to memorialize their visit to Coney Island’s fabled shore. Now sideshow performer and tech genius Fred Kahl is turning the time-honored souvenir photo into a 21st century art form with his 3-D scanning portrait studio. After launching a Kickstarter project to raise $15,000 to fund the venture, Kahl opened the tiny studio in a former fortune teller’s booth at 1208 Surf Avenue next to the Coney Island Sideshow. The Coney Island Scan-A-Rama is open Saturdays from 12 noon till 7:00 PM. “The vision is to create the world’s first affordable 3D printing portrait studio,” Kahl writes on his Kickstarter page. “As a backer, you will get your very own personal 3D action figure or family portrait!” Getting scanned takes only a minute, though one is required to stand very still on a slowly revolving platform as shown in this video. 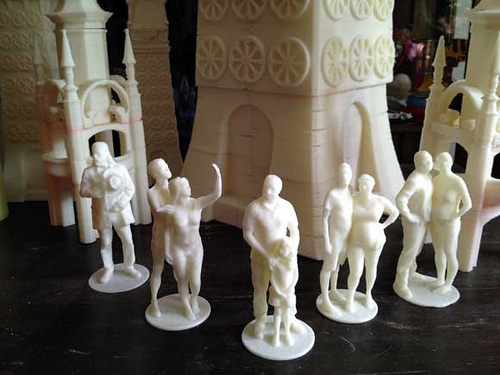 With Kahl’s custom hardware and workflow, printing the 3-D figurine can take 4-7 hours, depending on volume and complexity. Figurines of 2-3 people take longer, he says. Duplicates of the 3-D portraits will be featured in a populated scale model of 1914 Luna Park to be exhibited at Coney Island USA in 2014. Some of the 3-D towers and minarets can be glimpsed in the background of the photo below. Visit http://www.kickstarter.com/projects/fredini/coney-island-scan-a-rama for more info and updates. Update: Fred Kahl’s Scan-O-Rama 3D portrait studio will be open most Saturdays from 12-5pm through December 21, 2013 at Coney Island USA, 1208 Surf Avenue. Sorry, ATZ is not having a prize giveaway! 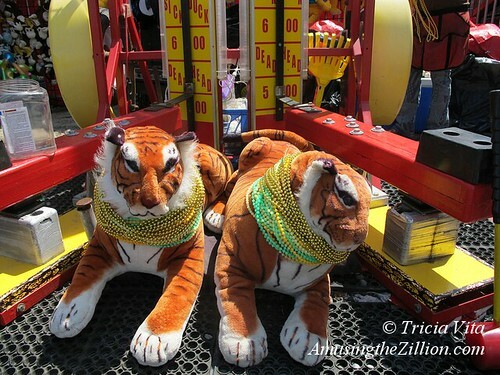 These plush tigers wearing Mardi Gras beads are among the prizes at the High Striker on West 12th Street in Coney Island. 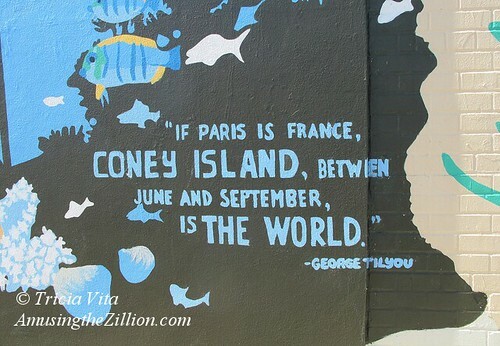 “If Paris is France, then Coney Island, between June and September, is the world,” wrote George C. Tilyou in 1886, when he was 24 and worked in his father’s Surf Bathing Pavilion. Eleven years later, he created Steeplechase Park, the first of Coney’s world-famous amusement parks. On June 1, 2013, in this summer of Coney’s comeback from Superstorm Sandy, Tilyou’s quote is truer than ever. Enjoy your summer — hope to see you in Coney Island!